Chief Minister Virbhadra Singh today said that his government was committed to safeguard the interests of the soldiers and ex-servicemen and all the best possible measures were being taken to provide them all the required facilities in the State. He was presiding over the State Level function of Indian Ex-Servicemen League organised at the Government Polytechnic Institute, Kangra.The Chief Minister said that our soldiers had made supreme sacrifices in the freedom struggle besides safeguarding the National and International boundaries. The gallant soldiers of Himachal Pradesh were always ahead fighting for sake of the Nation and making sacrifices thereby bringing laurels to the country and the State. The first Param Veer Chakra of the country was awarded to Major Somnath of Himachal Pradesh and out of total four Param Veer Chakras were given for Kargil aggression, two were given to brave sons of the State. He said that we were proud of our soldiers who were the source of the inspiration for everybody and it was our duty to give them honour and protect their interests at all cost. 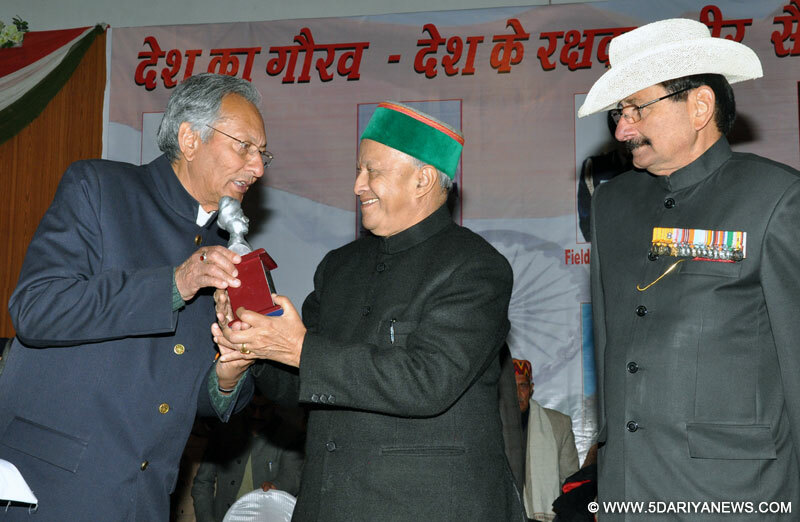 Shri Virbhadra Singh said that effective and speedy implementation of welfare schemes for ex-servicemen was being ensured by the State government which includes reservation in government jobs, scholarship schemes for their children, loan facilities for self- employment ventures besides various other incentives. The Chief Minister said that the State would effectively take up the issue of change in norms on basis of population for recruitment in the armed forces. He said that the long pending issue of one rank-one pension had been accepted by the Centre Government but few issues were still pending which would be effectively plead before the Union Government in large interests of ex-servicemen in the State. He said that the Government had increased the rates of annuity payable to Gallantry Award Winners and all other distinguished awardees. The Government had also introduced 34 welfare schemes for the rehabilitation and welfare of ex- servicemen, war widows and their dependents. were real heroes upkeeping the spirtit of secularism in the country who should be given due regard and best facilities. He demanded to remove population criteria in recruitment of the soldiers and setting up of State Training Academy for Armed Forces in the State. He also urged that the two Eco-Force Companies already established in the State and NCC wing should not be winded up. Birg. B.S Thakur, Chairman, Kullu Unit of the League urged for early opening of the CSD depot in the State.Lt. Gen. K.S Jamwal also spoke on the occasion.Birg. (retd.) R.K Rana welcomed the Chief Minister and presented the demand charter while Shri V.S Chauhan, Senior Vice President presented the vote of thanks. Shri Pawan Kajal and Shri Ajay Mahajan, MLA's, Shri Kewal Singh Pathania, former Minister, Shri Surender Kaku and Shri Bodh Raj, Ex-MLAs, Lt. Gen. P.K Rampal, family members of the ex-servicemen and other senior officers were present on the occasion.